My style of food-shopping and cooking is very much focused on whole ingredients…that makes for healthy homemade dishes that taste delicious. A tomato pasta sauce has become a staple in many Canadian kitchens. But many of us rely on jarred sauces. So try this one (and make a big batch to freeze): It’s packed with vitamins A and C–and it’s deliciously, authentically Italian. In a large pot, heat olive oil over medium-high heat. Add onion and garlic and cook until onions are softened, about 2 minutes. (If you like it spicy, add 1 tsp dried crushed red pepper flakes.) Add tomato paste and stir in water to dissolve. Stir in tomato puree, grated carrot, herbs, salt and pepper. Reduce heat to low, cover and bring to a gentle summer. Cook for 1 hour, stirring occasionally. Remove and discard bay leaves before serving tossed with pasta. Sauce will keep in the refrigerator for up to one week and freezes for up to one month. I had a bag of potatoes from the farmer’s market that I’d bought a couple of weeks ago, and knew I needed to do something with them before they started going soft. I also had a beautiful heirloom squash to use up. So I Googled a recipe for potato soup, and then modified it–a lot. It turned out amazing, if I do say so myself. The original recipe called for bacon and heavy cream, which I didn’t have, nor did I want to use. But the result is so flavourful, and creamy. Trust me and try this out! Toss the diced squash in a little olive oil and roast in the oven for about 30 minutes at 375 degrees. Meanwhile, in a large soup pot, heat the olive oil and cook the onion and celery until softened. Add the diced potatoes and saute for a few minutes. Add the broth, then the garlic and ginger, cover, and bring to a simmer. Cook until the potatoes are soft, at least 20 minutes. Stir in the roasted squash. In a saucepan, melt the butter. Whisk in the flour, then the milk, and finally the parsley. Whisk this mixture into the soup, and season to taste with salt and pepper. With a slotted spoon, remove about half of the diced vegetables from the soup pot and set aside. 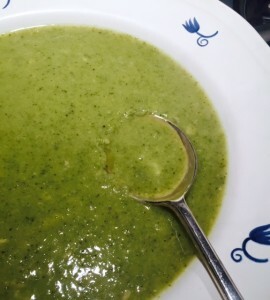 Use a handheld immersion blender to puree the soup right in the pot (or run it through a food processor or blender). Add the reserved cooked vegetables back to the soup pot and stir. 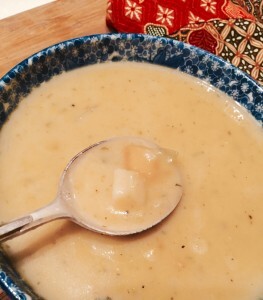 Enjoy this creamy, chunky and satisfying soup! Caramelize onions or shallots in a skillet on a stovetop with a little olive oil; add fresh chopped rosemary, and crushed garlic. When softened and fragrant, remove from pan. Brown around 8 to 10 sliced button mushrooms in the same pan. Remove from pan. Add chopped Swiss chard leaves to the same pan and heat through until leaves are wilted; remove from pan and wrap in paper towels, squeezing out the excess water. 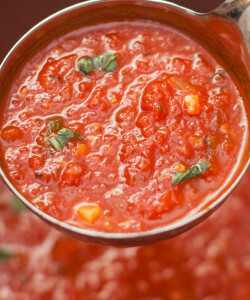 Spread on a few spoonfuls of jarred, chunky tomato sauce, preferably all-natural with no added sugar. Layer on the onions, herbs, garlic, mushrooms and chard. Add a few handfuls of grated mozzarella cheese, and sprinkle with grated Parmesan cheese. Bake for 15 or 20 minutes, or until crust is crispy and golden. If you planted zucchinis back in spring, you are probably experiencing the same thing I am: too many, and they still keep coming. But, they’re delicious, and good for you. For one thing, they’re really low in calories–just 17 per 100 grams–and they are also a great source of fibre. Here’s a recipe to keep you using them in delicious ways. Slice a medium zucchini in quarters lengthwise. Slice off the pulp and seeds from the core. Take a cheese plane and run it along the length of each quarter, piling the thin slices on a platter. 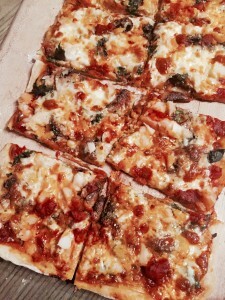 Throw on fresh herbs–I used basil and mint. Add fresh peas, cherry tomatoes and olives. 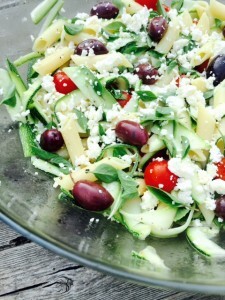 Sprinkle on some crumbled low-fat feta cheese, and drizzle with some good olive oil. Squeeze a half lemon all over the salad, and sprinkle on a little salt and pepper. Dice 1 medium onion and soften it in a little olive oil in a large saucepan. Add a sprinkle of ground ginger. Meanwhile, peel and cube 2 large sweet potatoes; chop up enough cabbage to make 2 cups cabbage; slice a handful of mushrooms. When the onion is softened, add the sweet potatoes and 2 cups vegetable broth. 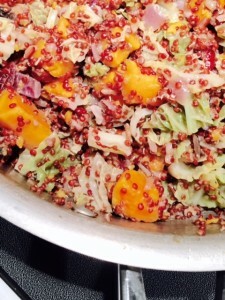 Add 1 cup of red quinoa; cover pan and let come to a boil. Stir in the cabbage and mushrooms, and salt and pepper to taste. Makes 4 servings. Great as a workday lunch the next day, too. Sauté one small diced onion in a little olive oil. Add a handful of finely chopped green beans, half a shredded carrot, two cloves crushed garlic, and 5 or 6 diced mushrooms. Simmer mixture until heated through. Remove from heat, transfer to a large bowl and allow to cool. Meanwhile, roughly chop up your leftover spaghetti (mine was whole grain) into shorter lengths. Also, finely chop some fresh parsley. Stir pasta and parsley, plus 2 eggs, into the cooled mixture. Mix well. 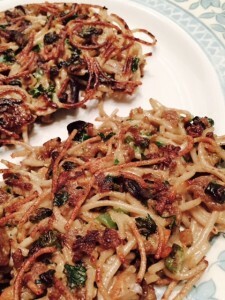 Into a hot nonstick skillet, drop large spoonfuls of spaghetti mixture and then flatten them a bit. When golden and crisp, flip. Serve hot with fresh grated Parmesan, and season with salt and pepper. I make this at least a couple of mornings a week for breakfast. Oats provide healthy fibre, and can naturally keep cholesterol in check. 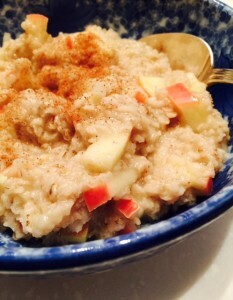 The apples add a naturally sweet boost, and the chia and cinnamon are both high in antioxidants. Use the “one-minute” or “three-minute” kind of oats; the instant type just isn’t as satisfying in texture, and often comes with a pre-mixed sugary mixture to add. Many people swear by steel-cut, and they are delicious, but not if you’re in a weekday rush, as they take a while to cook. Good old Quaker is my choice. For every serving of oatmeal, add one cup of water to a saucepan. Add a little salt, and bring to a boil. Once boiled, turn heat down to medium. Add a half-cup of oats for every serving of oatmeal (in other words, you use 2 parts water to 1 part oatmeal), plus a tablespoon of chia seeds, and stir well. Chop half an apple and stir into the pot. Stir occasionally over a couple of minutes, remove pot from heat and cover. Let sit another minute, then serve with a sprinkle of cinnamon. Top with coconut, soy, almond or rice beverage, or milk. Boost the sweetness naturally with a little honey or maple syrup. In the bottom of a large, heavy saucepan, saute one large chopped onion in a little olive oil until soft. Meanwhile, dice 3 large potatoes; you can either peel them first or leave the skin on. Chop one large bunch of broccoli, stems and all (but peel off thickest part of the stalks). Add potatoes and broccoli, plus 6 cups vegetable stock, to the onions in the heavy saucepan. Season with salt and pepper, and a few pinches of thyme. Bring to a boil. Simmer until vegetables are soft. Add a little shredded cheddar cheese, if desired. Remove from heat and allow to cool. Run through a food processor in batches. Reheat in the saucepan, or freeze. Dinner for 2: So fresh, so easy. Here’s how to make this dish. Take two boneless, skinless chicken breasts and slice each horizontally into four “scallopinis.” Dredge them in a little flour. Saute in a large heavy-bottomed frying pan in a little hot olive oil on medium-high heat, turning once until golden on the edges and cooked through; remove to a plate and keep warm. Meanwhile, boil your multigrain pasta–enough for 2 generous servings–according to package directions (I used Artesian Acres brand ancient grain organic spaghetti). Drain the cooked pasta, but save about a half-cup of the water. Next, to the pan you cooked the chicken in, add 2 cloves of crushed garlic and saute on medium heat for a minute or so; then add the juice of half a lemon and the reserved water and cook for a couple of minutes. Finally, add a couple of handfuls of thinly sliced kale and a handful of green olives. Stir-fry for another two minutes, until kale is wilted and olives are heated through. Season with a little salt and pepper. Add spaghetti to the pan and toss until well mixed. Divide spaghetti between two plates, and add slices of sauteed chicken, plus freshly shaved Parmesan and lemon slices, if desired. 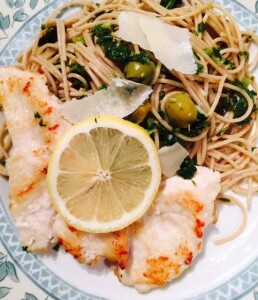 Delicious with white wine–try a pinot grigio.